Partners Albania following the implementation of the project “EMBRACE – Entrepreneurship Models Building Relations and Creative Economy” launches the second call for expression of interest by civil society organizations, for the capacity development program with regards to initiation /strengthening of the business models or entrepreneurship initiatives by CSOs, contributing to the development of social economy fostering inclusive development in the country. 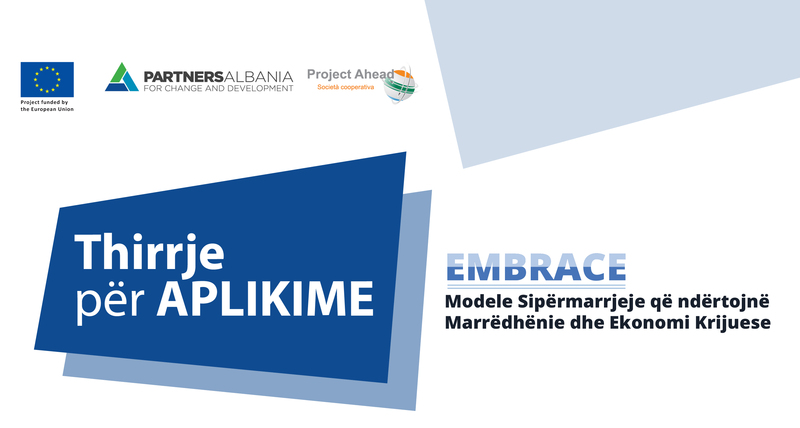 Partners Albania has contributed to the development of business models /entrepreneurship initiatives of 18 CSOs during 2018, in building bridges of partnership with the private sector, and financial support through the Social Entrepreneurship Sub-granting Scheme to some of the participating CSOs, facilitating the process of their organizational sustainability. The initiative will provide a significant contribution through a tailor-made training program and assistance to the CSOs on the development of business and entrepreneurship models; sharing of best practices with CSOs across the country and abroad, partnership building with private sector etc. Online mentoring sessions to exchange experience and learn from international partners; opportunities for mobility and company development in an international network of SEs. Participation in CSOs – Business meetings that will contribute to increasing knowledge and understanding of civil society work and their services, as well as identifying concrete partnership opportunities in providing these services. Interested CSOs are invited to apply by completing and submitting the Questionnaire and a Motivation letter which clearly states their interest to participate in the program and action plans to implement the acquired knowledge and skills. 15 participants will be selected to attend the 2019 program, considering a broad geographical coverage, sectors, gender representations, and past experience in engaging in economic activity etc. The Expression of Interest should be sent no later than February 5th to jalite@partnersalbania.org. Only the selected organizations will be notified within the first week of February and will be provided with more detailed information on the program and their participation.